This capacity crowd are here to see Andrew Bird but a lot of them have come into the venue early to see Martin Dosh, here just billed as Dosh, who is also known as Bird's drummer. He plays a half hour solo set using his drum kit, multiple keyboards and marimba, all which he uses to make his own live loops. This capacity crowd are here to see Andrew Bird but a lot of them have come into the venue early to see Martin Dosh, here just billed as Dosh, who is also known as Bird's drummer. He plays a half hour solo set using his drum kit, multiple keyboards and marimba, all which he uses to make his own live loops. His set begins in quite an ambient mood, but it builds into a full band sound and hints at modern American composers and post rock jazz like Tortoise. It's always tricky for an instrumental support to click with the audience, but the last piece in particular was really engaging. 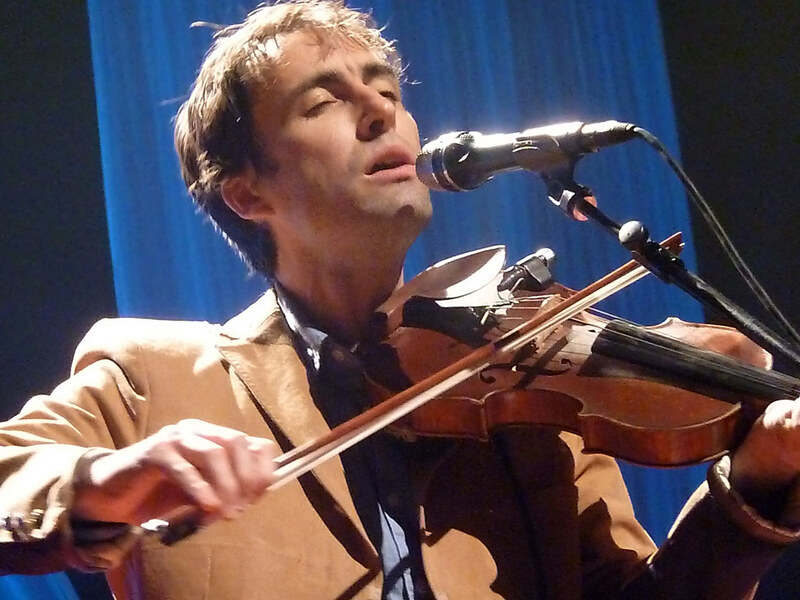 This is first show of this particular Andrew Bird tour, and his new album 'Break it Yourself' has literally just been released in the UK. He takes his space on his own red carpet and the set begins with the atmospheric, cinematic 'Hole in the Ocean Floor'. For this he is alone with his violin,which he then loops and sends it to a double set of spinning gramophone horns at the back of the stage. The horns face opposite directions and when they rotate they get picked up by two mics spaced at ninety degrees to each other, creating a rhythm out of the drone. He is being clever in a seemingly effortless way and when he launches into his distinctive whistling next, he has dazzled us before he has even sung a song. He is joined by the band for 'Degradation Breeds', the opening track on the new album, and they are immediately impressive in an understated way. Dosh is back on drums and the bass player and guitarist slot in to the mix well, and complement Bird's own layered loops and instrumental virtuosity. By the time they launch into the next song 'Danse Caribe', I'm struck that the music just pours out of him. If he isn't picking out melodies with his violin or guitar, he is singing or whistling. As if to underline what he thinks of his new album, he continues to play it in order. 'Give it Away' is next, a potential sing-a-along tune that no-one here seems to know yet. 'Eyeoneye' is lively, and sounds big and noisy; it's an epic sounding rock song and possibly a future anthem. Once he has nailed that one he is noticeably more relaxed. He refers to first night “shaky time” and nerves, but this really wasn't obvious. He starts to talk about the background to the new songs though, which brought the people who hadn't heard the album back on his side. 'Orpheo Looks Back' is the most complex song that they play, as it uses live loops created by Dosh the drummer as well as Bird's vocal loops. They manage to make these loops sound like a natural, organic band, and not electronic trickery. 'Sifters' is one of my favourites from the album, a beautiful song which has been inspired by a play of the same name by Sharon Lanza. 'Fair Shore' closes the new album showcase and he returns to the solo violin he began with, then switches back to solo guitar. Whilst I think the new album is great and I'm fairly familiar with it, it's clear that most of the audience aren't. When he returns to older material towards the end of the set there is a big cheer for the opening of 'Plasticities' as most of the crowd finally recognise something. He also returns to his back catalogue for 'Tables and Chairs' and promises to play some more older songs when he returns later in the year. Those spinning horns are an eccentric spectacle and they do have a dramatic effect on the music as well, and they keep spinning as the band leave the stage. 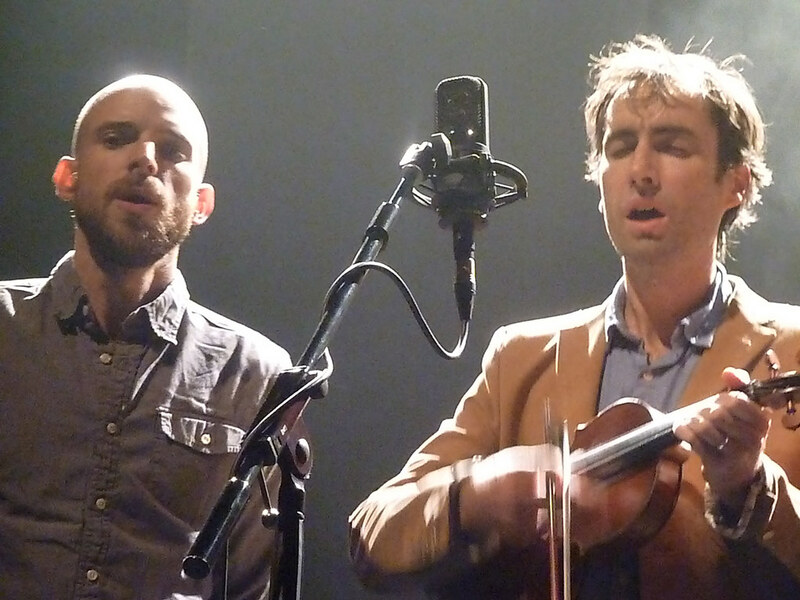 For the encore, three of the band gather around a single mic and play a traditional country gospel song with some amazing fiddle playing from Andrew. On this tune it definitely deserved to be called a fiddle not a violin! He then played a fine cover of the Handsome Family's 'So Much Wine' and then closed the set in fine style with his own song 'Effigy'. So many established acts tour a new album and choose the best tracks from it to work into their set. I'm sure there were some here who wished for more songs from his previous albums, but judging by the reception, most of the audience were impressed. It was a bold decision to play 'Break It Yourself' in order, but I reckon it was one that paid off.